Exactly one hundred years after a traditional wooden chattel house was built in Fountain village, Eric Lamb orchestrated its move - on a flatbed truck - to a new location at the head of the Spring Hill valley. After much hard work, sympathetic additions and plenty of imagination, it became one of Nevis' premier rental properties, "Lambsdown". It was so popular that he has recently added three more cottages. 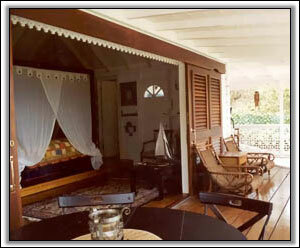 One - The Garden Cottage – is, as its name implies, in the garden of the main house. 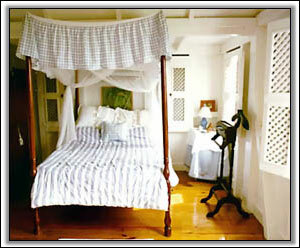 Although not of the same era as the original, it is built in the same timeless Antillean style with local stone and artifacts from neighbouring islands, with an attention to detail that is one of the main features of these romantic retreats. Two further eco cabins have been erected on stilts above the forest canopy at the top of the valley just across the trail from the main house. They are called Firefly, named after the captivating insect that is, on a clear night, indistinguishable from the stars above. All four cottages, although within 50 meters of each other, offer total privacy and tranquility and in the case of Firefly, a unique vantage point to observe the varied wildlife of the valley at close proximity. They can be rented as a whole or separately. 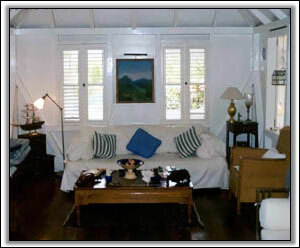 Although situated at the base of Nevis Peak, the cottages are within easy reach of all the essentials of a Caribbean holiday. Good beaches and water sports are just 2 minutes drive, five restaurants are within 5 minutes and wild mountain hikes and beautiful views are right on the doorstep. Fruits and vegetables grown in our dark volcanic soil are readily available at the octagonal shop opposite Tequila Sheila's beach hotel and restaurant at Cades Bay, just a couple of minutes away. The Four Seasons Resort golf course and town are fifteen minutes away. 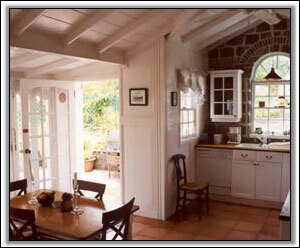 A two bedroom /bath cottage with a small child's room, suitable for a couple or small family. Polished pine floors combined with cooling white woodwork and local antique furnishings are its hallmarks. A gorgeous living-room leads you through to the saltillo tiled gourmet kitchen with everything a modern cook on holiday needs! Glazed French windows separate you from the intimate gazebo and discreetly positioned pool in the mountainside garden to the rear of the property. 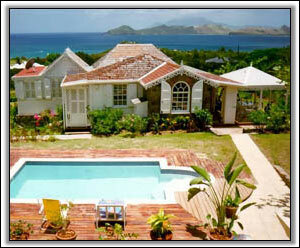 Expansive well kept gardens with a variety of tropical species. Bathroom 1: Not ensuite but across the passageway. Cast iron pedestal tub and shower. 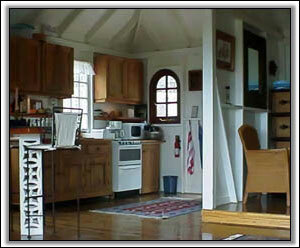 CD and tape player, cable TV, phone, washing-machine, ceiling fans, A/C in the bedrooms. Gas oven and range, BBQ, dishwasher, coffee-machine, blender, toaster, fridge-freezer. Nestles unobtrusively into the sloping gardens of the main house, and is screened from it by some excellent examples of locally crafted volcanic stone walls and terraces. 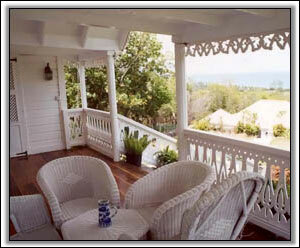 The cottage is a subtle blend of old Caribbean with modern touches, beautifully crafted to a very high standard, no comfort has been spared. 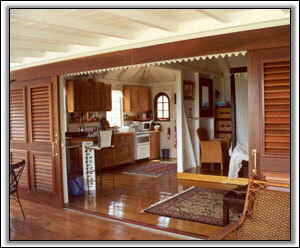 It is essentially a romantic one room cottage for two persons. Wide ocean facing balcony with a Jacuzzi for the ultimate in relaxation. Kitchen/Living-room/Bedroom – King-size 4 poster. 24'x16' with gingerbread partition. Bose CD and tape player, flat screen cable TV and DVD, phone, ceiling fans, air conditioning. Fernella the housekeeper will clean 3 mornings per week. Gas oven and range, BBQ, dishwasher, coffee-machine, blender, toaster, fridge-freezer, microwave. By car: Airport 6 minutes, beach 2 minutes, Four seasons 15 minutes, Town 18 minutes.